Before starting the talk, I’d like to point out that although the title of this talk is “Early Times”, it does not mean early times for Millie and Gene-sensei, who had been researching carbon 50 years ago. I’m referring to the early days of research into carbon nanotubes in 1991, which was very important to the field and to my life. I'm very happy to see Gene-sensei here, today, as well as many of the friends and collaborators that I have made over my 25 years of collaboration with the Professors Dresselhaus. Above is Professor Uemura. He’s my grand-supervisor — in other words, he is the supervisor of my supervisor. He is considered to be a pioneer of graphite in Japan, and he collaborated with Millie for a long time ago. Their collaboration started in the 1960’s. Millie’s first trip to Japan was in 1970, when she attended the Japan-USA seminar on the new materials science of Carbon and Graphite, and she attended it alongside Professor Uemura (not pictured here). You can also see Professor Sugihara in this photo — another of Millie’s Japanese collaborators. 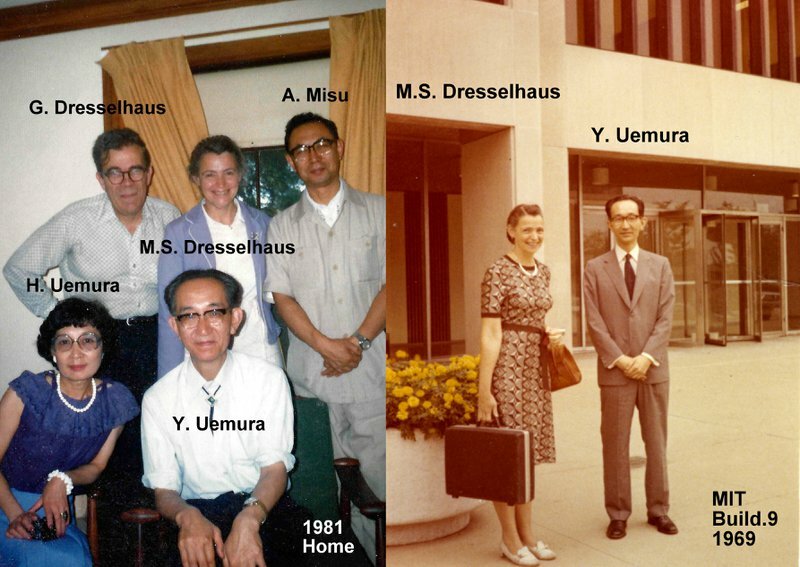 The entire Dresselhaus family then came to Japan in June, 1973. I’d like to briefly mention someone else central to both my life and Millie’s. 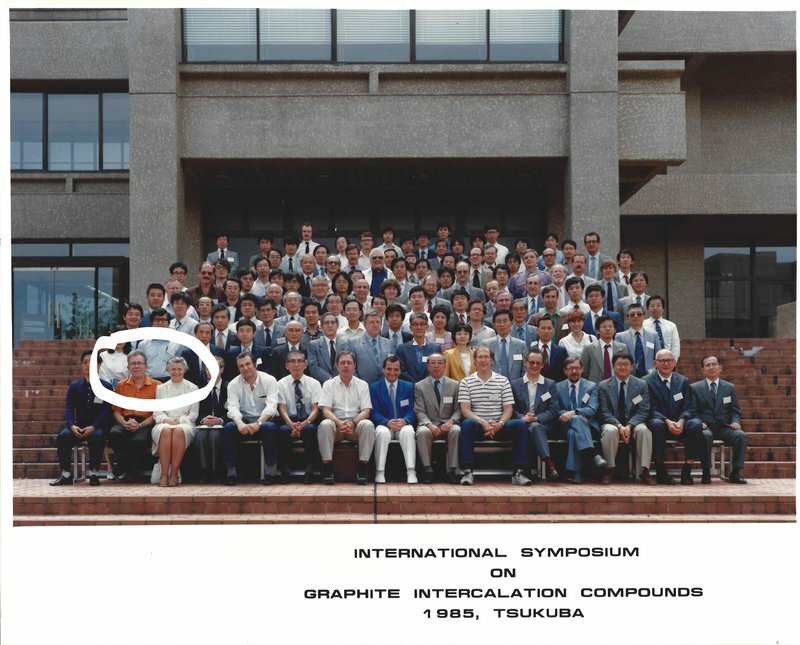 My supervisor is Professor Kamimura, and he collaborated with Millie-sensei in 1980’s on graphite intercalation compounds, which was subject of my PhD thesis in 1985. They were great friends and have collaborated since then. Saito saw Millie-sensei for the 1st time at ICPS Kyoto 1980. Now, I move on to my experiences with Millie-sensei. 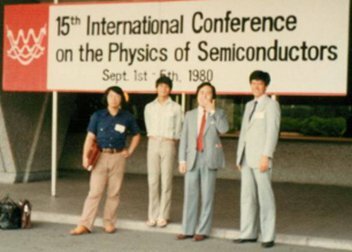 I first met Millie-sensei at an International Conference of Physics Semiconductor in 1980 in Kyoto, when I was a graduate student. Unfortunately, I didn’t have much of a chance to talk to Millie-sensei at that time. Later, at a conference on graphite intercalation compounds in 1985 in Tsukuba and a different workshop in Okazaki which I attended with Professor Kamimura, I did get a chance to talk with Gene-sensei and Millie-sensei. Although I did not remember what I talked to them about at the time, that first meeting would lead to a year that changed my life. Let’s discuss that most important year — from '91 to '92. I received the opportunity to come to MIT for 10 months, to research a very important new topic in carbon research: carbon nanotubes. My host professor was Gene-sensei, although it’s worth noting that Gene-sensei and Millie-sensei always worked as a team and spoke together about everything. When I talked the daily report to Gene-sensei in the afternoon before going home, Millie-sensei would always know everything the next morning and be happy to help. Thanks to this year, I wound up getting several papers published when I was 32.. At that time, Gene-sensei and Millie-sensei were 62 or 63, respectively. Although I have collaborated with them for 25 years, I have not yet reached their ages. I hope that, when I do, I am still as lively and active as they always were. 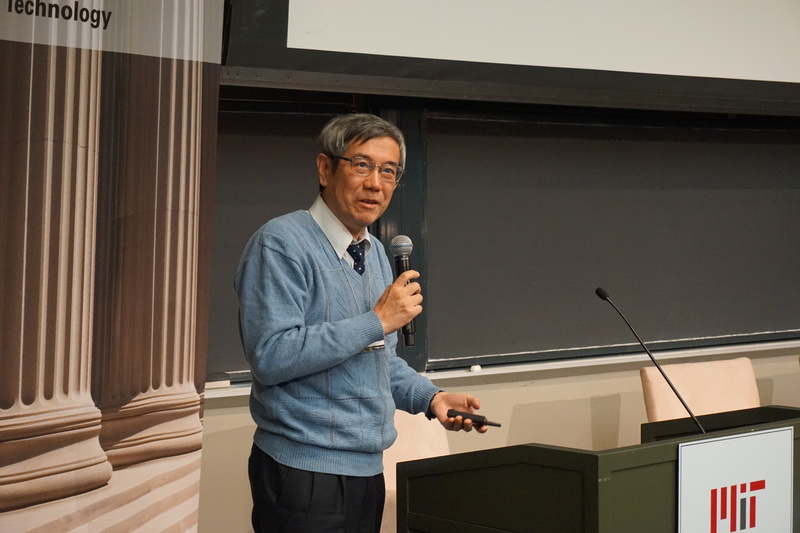 While I was at MIT, there was another researcher there, Fujita-san, who was also from Japan. He came to MIT at almost the same time as I did, but his host professor was a very famous professor in theoretical condensed matter physics. 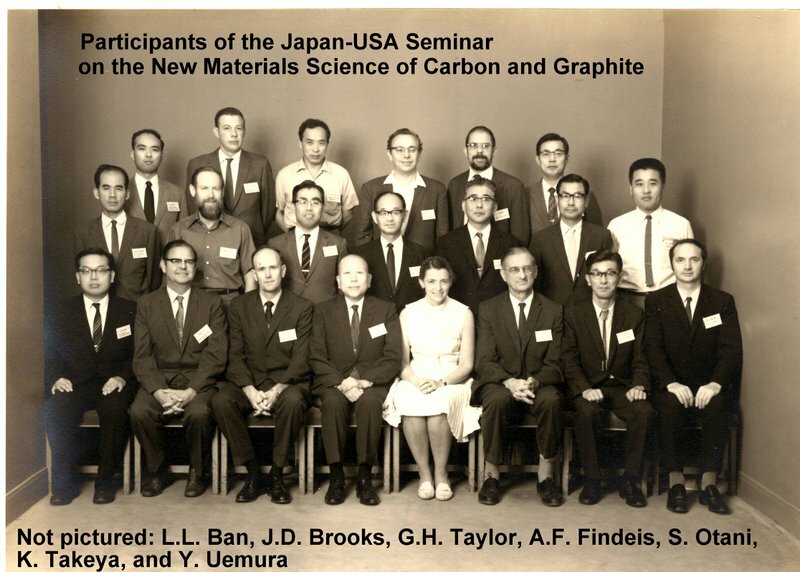 Fujita-san was asked to work on another project that didn’t interest him so much, so he began sitting in on MGM meetings to hear about carbon nanotubes — something that interested him much more. He used to come by Gene-sensei’s office and my office and discuss carbon nanotubes with us. He gave us many ideas and was very helpful. In a short amount of time, we published a paper, together. The first paper was published with Millie-sensei as first author, and in that paper, we discussed the possible structures of nanotubes and the group theory analysis. They put me as a co-author of that paper since I made one figure to explain how to roll up the graphene sheet in a general way. Then we calculated the electric structure of nanotubes and found very interesting phenomena that was quite unique in physics. I spent a very exciting 10 months at MIT discussing, collaborating, and writing papers about carbon nanotubes. I wrote 10 papers during these 10 months and felt very productive. Then, finally, at the very end, I woke up one morning and realized that I’d forgotten to take any pictures at MIT! On almost the very last day, I brought my camera into the office and took some pictures. Millie-sensei was very surprised to see that I had suddenly appeared in her office with my camera! But she understood, so she posed for this picture. We had a party at Millie and Gene-sensei’s house, and I brought my camera to that, too. We enjoyed that party very much, since it was the very last time that we would be together to do such a thing. Since that time, I’m happy and privileged to come to MIT every summer. At first, of course, it wasn’t that easy to go to the USA. At that time, I could not visit a foreign country by using the research money I received in the early 1990’s. I tried to find some foundation that would sponsor me to get enough funding to get to MIT every summer. I was very good at finding the money! I came to MIT for one month, every summer. I borrowed the Dresselhaus’ rice maker that we bought in Boston and used in it 1991 and 1992. After their using the rice maker for 10 years, the rice cooker malfunctioned and we realized that continued use would not be safe. Then Marianne-san bought a new rice maker for them, and I borrowed the new rice maker whenever I visited MIT with my family. Millie and Gene-sensei loved the old and new rice makers and always referred to them as ‘Saito’s rice maker’. This gave me a great opportunity to make and eat lots of rice with them. We really enjoyed that. Every weekend, we would walk around the countryside and discuss carbon. It was fun and we got to see a lot of very interesting places while discussing very interesting science! And my children, who loved the wild blueberries of New England, always came with us. This was important for them, since I could expose them to both the larger world, in general, and the larger world of science! As you can see from the photos, my children were exposed, from an early age, to undergraduate students that now study science. Around the 1990’s, the internet began to really take off, and that created a real opportunity for international collaboration. By using the internet, we could have many collaborators in different countries, and still receive the paper back in a timely manner. When we are writing the paper, I would know I need to send it to MIT (via the internet) before 5 PM JST. Then Millie-sensei would quickly fix up the paper, and Gene-sensei would send it back to me before I woke up the next day. You can see that, in such a way, we can write a paper together over the span of 24 hours without losing the time, using the time difference between opposite sides of the world! Then, later, the Brazilian collaborators joined into the research project. Thanks to the internet, we were still able to make this work by splitting the 24 hours into 3 part (8 hours for each group). We could pass the papers, through email, from one to another to another, editing and fixing and collaborating without stopping the work. It seems my time is up. But I’ll just share a little more with you by quickly showing the many photos I took. Over the past 25 years, Millie has been a very good collaborator, as these photos will show. We always discussed things at MGM meetings. The style of those meetings never changed, with their lunches and casual conversations. Sometime there were Chinese dishes for lunch. The MGM meetings never ended — not even around the entire world! These MGM meetings happened in jungle of Brazil, in Sendai, in Nagano, in San Francisco! Anywhere we could get together, we’d have another MGM meeting. Here are some photos of the NEDO international collaborations I did with Iijima-sensei, Ajayan-san, Tennne-sensei, etc. 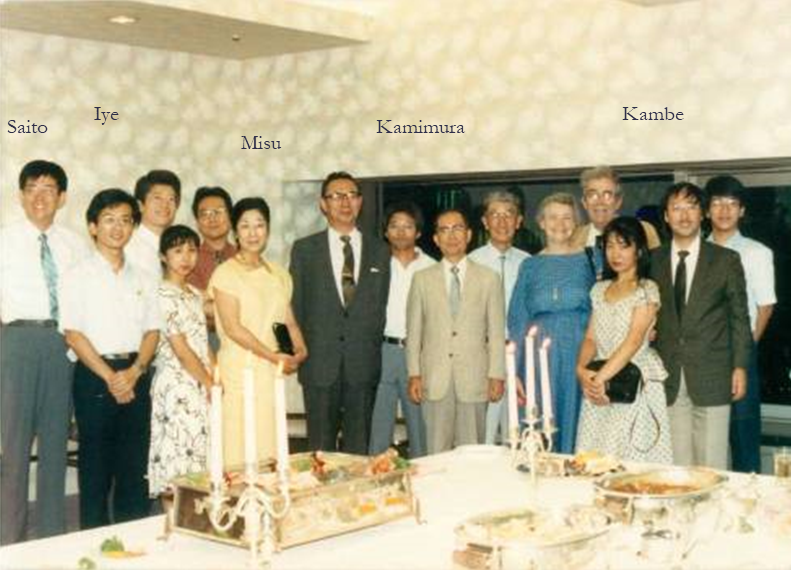 Millie-sensei frequently came to Japan (several times a year). 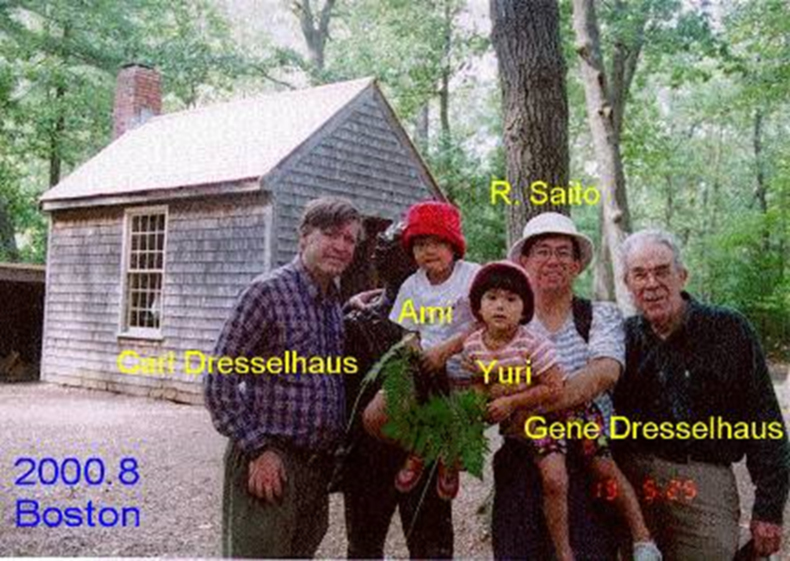 Thus, my daughters still consider that Dresselhaus-sensei are their grandparents in the United States. Here, we picked up photos of Millie-sensei with many young scientists. Millie-sensei would always talk with many young scientists, helping them with their research questions and encouraging them in their future work. 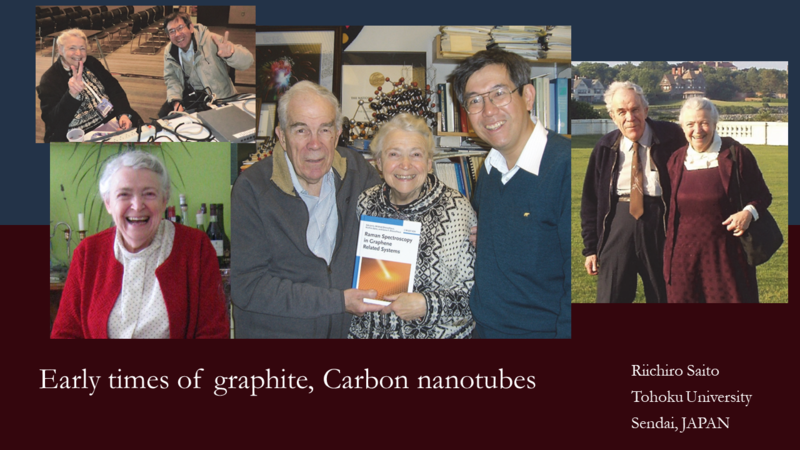 Her discussions, her encouragement, and her patience with them was very influential to the field of nanotubes.